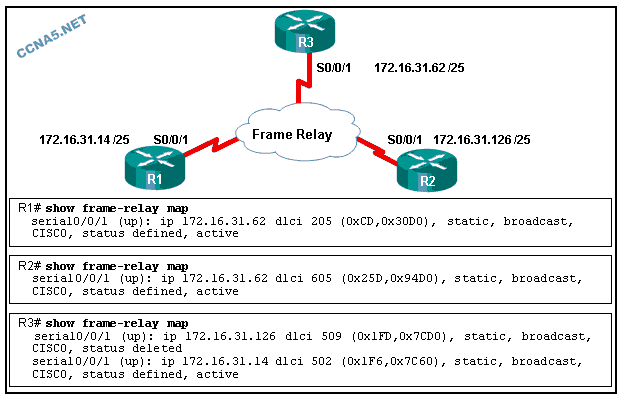 What is a characteristic of Frame Relay that provides more flexibility than a dedicated line? One router WAN port can be used to connect to multiple destinations. A router interface connects to a Frame Relay network over a preconfigured logical circuit that does not have a direct electrical connection from end to end. Which type of circuit is being used? Which Frame Relay topology provides a connection from every site to every other site and maintains a high amount of reliability? Which technology allows a Layer 3 IPv4 address to be dynamically obtained from a Layer 2 DLCI? A network administrator has statically configured the LMI type on the interface of a Cisco router that is running Cisco IOS Release 11.2. If the service provider modifies its own LMI type in the future, what step must the network administrator take? The network administrator must statically set the LMI type to be compatible with the service provider. Which parameter would be specified in a Frame Relay provider contract for a particular company? Why would a customer request a Frame Relay circuit with a CIR of zero? Which provider-negotiated parameter would allow a customer to send data above the rate of the bandwidth specified by the CIR? The IPv4 address of interface S0/1/1 on RB is 192.168.1.2. The DLCI that is attached to the VC on RA to RB is 62. Refer to the exhibit. Which statement is true about Frame Relay traffic on R1? Traffic that exits subinterface Serial 0/0/0.102 is marked with DLCI 201. Use a full mesh topology. When would the multipoint keyword be used in Frame Relay PVCs configuration? Distance vector routing protocols are unable to forward routing updates back out the incoming interface to other remote routers. Link-state routing protocols are unable to complete neighbor discovery. Refer to the exhibit. A network administrator has implemented the show interfaces serial 0/1/0 command. What can be verified from the displayed output? Router R1 is forwarding traffic on interface serial 0/1/0 using the local DLCI 1023. 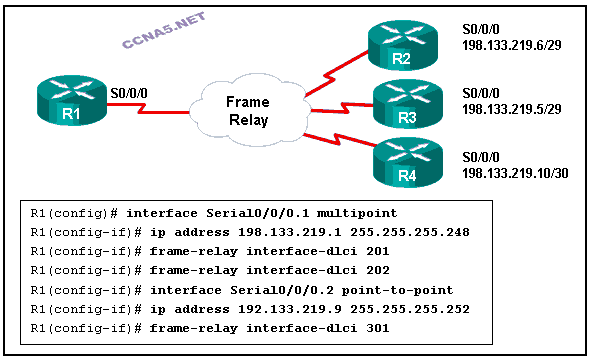 The show frame-relay pvc command is best utilized to display the number for which type of packets that are received by the router? Refer to the exhibit. A network administrator is configuring Frame Relay subinterfaces on R1. A distance vector routing protocol has also been configured. Data is routing successfully from R1 to networks that are connected to R2, R3, and R4, but routing updates between R2 and R3 are failing. What is the possible cause of this failure? Split horizon is preventing successful routing table updates on the multipoint link. Refer to the exhibit. A network administrator issues the show frame-relay map command to troubleshoot the Frame Relay connection problem. Based on the output, what is the possible cause of the problem? The S0/0/1 interface of the R2 router has been configured with the encapsulation frame relay ietfcommand. The Frame Relay map statement on the R3 router for the PVC to R2 is configured with an incorrect DLCI number. Fill in the blank. Use an acronym. The Frame Relay “DLCI” identifies a connection from one endpoint to a remote destination. The encapsulation frame-relay “ietf” command enables Frame Relay encapsulation and allows connection to a device from a different vendor. 27. What is an advantage of Frame Relay WAN technology compared with leased lines? 28. A network administrator of a large organization is designing a Frame Relay network. The organization needs redundancy between some key sites but not all. What WAN topology should the administrator choose to meet their needs?